Soulja Boy will perform Apr. 29 at Okinawa Music Town’s Oto Ichiba. 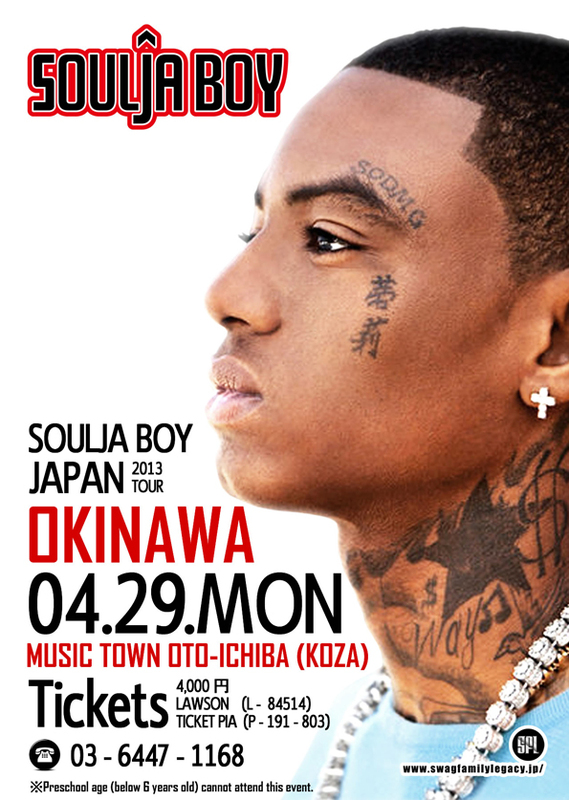 The Okinawa public performance of the rapper Soulja Boy, a Chicago native, is performed in Oto-Ichiba on April 29th. Doors open at 6 p.m. for the 7 p.m. concert at Music Town. Open seat tickets are ¥4,000 in advance. VIP tickets, which include a reserved seat and back-stage pass are ¥16,000. Tickets are available at 03-6447-1168 Monday through Friday 11 a.m. ~ 7 p.m. from Swag Family Legacy, from Lawson, L-84514, and Ticket Pia, P 191-803. Guests must order one drink. Preschool age children, under six years old, cannot attend the concert. Kids 6-10 can enter if they’re accompanied by their parent. Soulja Boy began his career in 2007, when as a 16-year-old came out with the single “Crank That”. That single gained the first place for a total of seven weeks on the Billboard Hot 100. The single was based on his self-producing, which went via the Internet, such as Youtube and Myspace. Utilizing Internet services, such as youtube, he created himself as a social-phenomenon rapper who made even the arrangement of a dance much in fashion with its music. He attracts attention as one rapper representing generation digital of now. DeAndre Cortez Way was born July 28, 1990, but is better known by his stage name Soulja Boy. Tell ‘Em, or simply Soulja Boy, is an American rapper, record producer, actor, and entrepreneur. He has currently released three studio albums and one independent album: his debut studio album Souljaboytellem.com (2007) was certified platinum by the RIAA. However, his next two albums, SouljaBoyTellem (2008) and The DeAndre Way (2010) did not match the commercial success of his debut, the latter only selling 100,000 copies, despite the success of several singles across both albums, such as “Kiss Me Thru the Phone” and “Turn My Swag On” (iSouljaBoyTellem) and “Pretty Boy Swag” (The DeAndre Way). This was mainly due to negotiation problems with Interscope Records which meant a limited amount of records were made available to the public. He has confirmed he is working on his fourth studio album, entitled U$A DRE, which will be released in 2013.